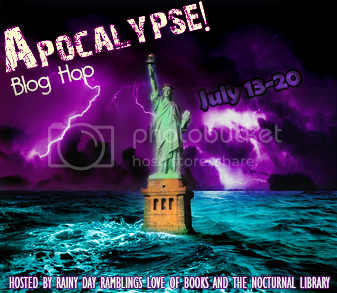 Apocalypse Day #3: Dark Inside by Jeyn Roberts: Guest Post, Giveaway and Review! Day Three of the Apocalypse is upon us! I hope you have survived so far. Saturday we encountered the deadly virus in PODS that wiped out most of the human population, and people survived by living underground in PODS, only to arrive topside and find mutant humans! Jeyn Roberts grew up in Saskatoon, Saskatchewan, and started writing at an early age, having her first story published when she was 16 in a middle-grade anthology called LET ME TELL YOU. When she was 21, she moved to Vancouver with dreams of being a rock star, graduating from the University of British Columbia with a degree in Writing and Psychology. For the next few years she played in an alternative/punk band called Missing Mile before moving to England where she received her MA from the prestigious Creative Writing graduate course at Bath Spa University. Jeyn is a former singer, songwriter, actress, bicycle courier and tree planter. An avid traveler, she’s been around the world, most recently, teaching high school in South Korea. A lover of animals, Jeyn volunteers regularly with helping abandoned and abused animals, especially cats. You can find Jeyn on her website, Facebook, Twitter and Goodreads. Hey all, Jeyn here, the girl with the dark insides. So I've been asked to write a bit about how I might personally survive the world of Dark Inside. I'm going to be honest here and say I probably wouldn't. I'm too naive, a crappy runner (I had ankle surgery from a bad break), and quite possibly the most trusting person in the world...all bad things for surviving a Bagger attack. I probably wouldn't last the first night. But putting all that aside, this is what I'd hope to do if Baggers took over the earth. Don't get me wrong, I've thought about this a lot. I think about it every time I watch a zombie movie or whenever I'm working on Dark Inside related stuff. It's a question that floats through my mind often enough to become somewhat embarrassed now and then. First off, it depends on where I am. I live in Vancouver in an older building that probably isn't Earthquake friendly. But let's assume that I'm at home and my building doesn't end up in shambles. I think I'd probably go outside and try to help people at first, but hopefully I'd be smart enough to quickly realize that's a death wish waiting to happen. By then, I'd go inside, lock the doors, fill the bathtub with water, and wait out the first wave. I think what I'd do is head north and away from the city. I'd pack up the cat and get into my car (hopefully with a full tank) and take the first road outta town. Hopefully this would be in the summer cause I'd be less prepared to deal with a northern Canadian winter. But it's one thing to write about the smart things one would do in such a situation. I'm sure it would be completely different if it actually happened. I dunno, what would you do? Thanks, Jeyn! I don't know what I would do, I like to think that I would be brave and resourceful like all those great characters we read about, but who knows. Hiding under the bed sounds like a good idea to me, better get those hair balls out from under my bed, you never know! A huge thank you to Jeyn for posting today! Thanks Jeyn! Hugs! Okay now to the goods! Jeyn is kindly offering up a chance to win a copy of Dark Inside. To enter read Contest Policies and fill out the Rafflecopter... and here is the best part: This is open Internationally! I hope you all will check out this series is is fantastic and scary! Since the beginning of mankind, civilizations have fallen: the Romans, the Greeks, the Aztecs...and now us. Huge earthquakes rock the world. Cities are destroyed. But something even more awful is happening: An ancient evil has been unleashed, and it's turning everyday people into hunters, killers, and crazies. This is the world Mason, Aries, Clementine, and Michael are living in--or rather, trying to survive. Each is fleeing unspeakable horror, from murderous chaos to brutal natural disasters, and each is traveling the same road in a world gone mad. Amid the throes of the apocalypse and clinging to love and meaning wherever it can be found, these four teens are on a journey into the heart of darkness--and to find each other and a place of safety. Four Stars: An original apocalyptic thriller! It begins with a tremendous earthquake.....buildings topple, fires burn, and civilization as we know it ceases to exist. As terrifying as the earthquake was, it is only the beginning. Soon mankind turns upon each other as they are taken over by the darkness that lives in their souls. The evil that we all hide within us, pushes forth and people begin murdering each other for no apparent reason, they are the Baggers. There are a few who are not afflicted, and they attempt to survive the Baggers. Can the darkness inside be overcome? Wow! This book starts off with a bang! You are immediately thrust into the horrific destruction of society as you witness earthquakes, fires and murderous rage. This book is riveting with its frightening story line. I was hooked! It totally reminded me of a Stephen King book, and that is saying a lot! I liked that this book incorporates five different view points. There are two boys and two girls and the mysterious Nothing. I enjoyed seeing how each character handled their circumstances as they fought to survive. Some were more heroic than others, and I definitely found myself identifying more with Aries and Clementine than Michael or Mason. I don't know if that is because I am female or if it was because I thought the girls conducted themselves better. I especially felt for Clementine as she was alone for most of her journey. This book ratchets up the terror factor and it maintains a hefty dose of suspense. You are stumbling blind across the devastated United States, trying to avoid the murderous Baggers. You are dying to know what drives the Baggers and you hold your breath through each encounter wondering if it will be the end of a character. If you like dystopians that keep you on the edge of your seat be sure to check this one out. I enjoyed the uniqueness of this book. I was expecting to go in and find zombies or something along those lines, but what I got were the Baggers which were entirely original. A Bagger is a normal human who is overcome by the evil in their soul. They lose all sense of morality and humanity as they become vicious killers. A Bagger will strike down their own family as they are driven by hate and rage. Believe it or not, I was pleased to not find a romance in this one. Even though there is the briefest hint at one, I was glad that it didn't happen and that the story stuck to trying to survive, because let's face it, a romance doesn't exactly always belong in an apocalyptic book. I think if I were fighting to survive the last thing on my mind would be falling in love. That doesn't mean that a romance won't develop in the sequel. I will be interested to see. While I did enjoy the multiple view points, I did find it a bit rough at first adjusting to the different voices. At times, I was confusing Mason and Michael, but by the end it was clear and easy for me to tell everyone a part. I didn't like that after the first few days, the book skips ahead three weeks. I wished that it had just stayed in the moment, I would especially liked to have seen how Clementine managed to get as far across the country as she did alone. Daniel is extremely mysterious and I was dying to know more about him. There is something at the end that is very revealing, but I am still eager to know exactly who or what he is. The ending doesn't exactly reach a resolution. This doesn't end on a cliffhanger, but it does leave so many unanswered questions. I still need to understand more about the darkness and why not everyone is affected by it. I am guessing my questions will be answered in The Rage Within, and luckily for me it is out now and I don't have to wait! Dark Inside is a fast paced, frightening trip into an apocalyptic future where humanity is overcome by the evil that hides inside. Strap in and prepare for a thrill ride as you traverse the devastated country trying to avoid the murderous Baggers. This is definitely not a zombie book! If are looking for something terrifying and original definitely give this series a go! I couldn't put this one down! "The nothingness. No fire trucks, ambulances, police cars. No people, cars, stereos, televisions, computers. All the things we use to replace the silence of loneliness. All of the distractions we buy that fill up the empty voids inside our souls. It's all gone." "We have a brilliant history of all the ugly deeds we've done. We're rotted straight to the core. The disease finally won battle. We've never had a cure, and the symptoms are out of control." "She'd give anything to curl up in her bed with her warm blankets. Her bed was the unreachable dream." "As long as I'm not forced to eat Spam and canned turnips, I'll survive," she said. "I don't get Spam. What exactly is it? Ham? Lunch meat? It's creepy." "There are different types of people in this world. There are people who accept what's in front of them unquestioningly. They live in the dark. In defeat. Ignoring what the future might bring or how they might help to make things happen. Then there are people like me. Optimists. They too live in the dark, in times like these, but dream of the light. I trust in the possibilities of betterness. I believe there is more to life than this. I have to. There's no other choice for me." "She is nothing but ordinary." "Her hair holds the wind and her eyes will see my soul," the brave said." "People always looked beautiful when they slept, vulnerable and innocent." "We all want to make our mark in life, right? It doesn't have to be big. Sometimes we just want people to remember we were here." Whew! You survived Day Three of the Apocalypse Tour....now be sure to head over and check out my co hostesses' stops. For those of you wanting to get in on the fun, feel free to link up your Apocalyptic Reviews and Giveaways below. See you back tomorrow for Imitation with Heather Hildenbrand!